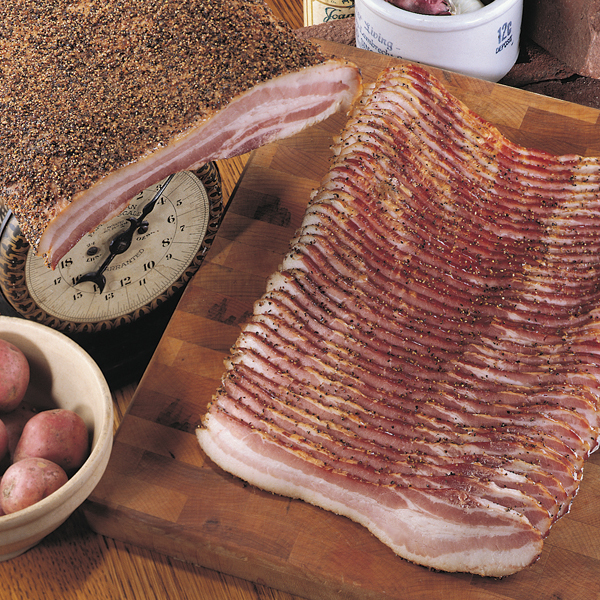 Our Applewood Smoked Pepper-Coated Bacon is a terrific bacon for cooking with, especially this time of year. We create our “pepper bacon” just like our classic Applewood Smoked Bacon; with specially-selected, hand-trimmed bellies that get our signature long, slow smoke in the Nueske family’s smokehouses, over glowing embers of sweet Wisconsin applewood. The step that makes this bacon even more special is that we take the time to hand-rub each belly with a blend of fresh-cracked Tellicherry Peppercorns before sending them into the smokehouse for the finishing touch. This gives our rich, smoky bacon the extra kick of zingy black pepper and makes it a natural addition to some of our favorite summer recipes. • As soon as your summer tomatoes are ready, use Pepper-Coated Bacon in your next BLT. Don’t forget the avocado for an ABLT!• Top your burgers with sharp cheddar, grilled mushrooms or onions, and Pepper-Coated Bacon.• Wrap grilled meats, like filet, in Pepper-Coated Bacon. Try wrapping bundles of veggies, too, like asparagus or green beans. • Add Pepper-Coated Bacon to your favorite potato salad. If you need a recipe to try this substitution with, here’s our favorite. Nueske’s Applewood Smoked Pepper-Coated Bacon, hand-rubbed with Tellicherry peppercorns. Don’t get us wrong – this stuff isn’t just an ingredient. We love this bacon all by itself on a traditional breakfast plate, but its more-intense flavor is just right for making recipes really stand out. Give it a try. If you need recipe ideas, you can contact us anytime on Facebook or Twitter. We would be happy to get that information for you. You can call us at (800) 392-2266 or email orders@nueske.com …or, if you like, let us know right here what you are trying to avoid and we can reply back. All of our bacon is diary, gluten, trans fat, and MSG free.